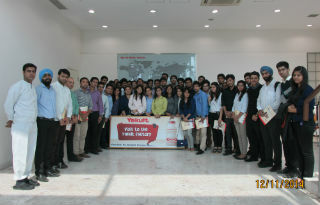 PGDM Students went for Industrial Visit to Yakult, Sonepat, Haryana on 11th Nov’14& 12th Nov’14. Visit started with presentation by the company on the emergency exit plan of the area which is a part of the organisation’s OHSAS certification programme. Then abrief introduction about the company, its origin and its current position having global presence is briefed to the students. The concept of Shirota-ism was also explained to the students. Yakult Danone India (P) Ltd is a 50:50 JV between Yakult Honsha, Japan and Groupe Danone of France, both of which are global probiotic leaders. Yakult is manufactured at an ISO 9001:2008, HACCP and OHSAS 18001:2007 certified manufacturing facility in Sonepat, Haryana in India. Students were allowed to visit the factory and each and every step in the process of manufacturing of the probiotic health drink, starting from the germinating of the Lactobacillus casei strain Shirota (LcS) bacteria to enlarging it to the desired production and keeping a close eye on the quality control to the packing and packaging of the final product were shown to the students. All the queries resulting in the minds of the students were resolved well by the guide. Students participated with enough zeal to make the visit interactive & gained maximum knowledge during the visit. 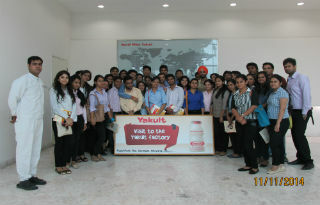 The students were given cookies and a bottle of yakult (65ml). The session ended by a group photo of all the section and after doing all the formalities, the students expressed thank you and bid good-bye to the company staff.